But expect a battle to make the full report public. In a letter to Congress summarizing the results of special counsel Robert Mueller’s investigation into Russian interference in the 2016 election, Attorney General William Barr wrote that the special counsel found that the Trump campaign did not coordinate with Russia. On the question of obstruction of justice, though, Mueller didn’t come to a conclusion, stating that “while this report does not conclude that the President committed a crime, it also does not exonerate him.” The ball is now in Congress’s court, so you can expect a political fight in the coming days and weeks to make the full contents of the report public. In January, I outlined five scenarios for how the Mueller investigation could end. Barr’s summary decisively avoids the worst-case outcome for Trump — being implicated in some form of coordination with Russia during the 2016 election. As the Mueller investigation unfolded, the special counsel’s team described the myriad ways that the Russian government worked to boost the Trump campaign and undermine Hillary Clinton’s candidacy — we just didn’t know whether the Trump campaign was linked to those efforts. So in that sense, Barr’s summary is very good for the president, because Barr noted that despite multiple overtures from Russia to assist with the 2016 Trump campaign, no campaign official “conspired or coordinated” with the Russian government. The conclusiveness of Barr’s language may also put a damper on House Democrats’ efforts to continue to investigate potential coordination between the Trump campaign and Russia. Barr’s summary does, however, fall fairly squarely into the second scenario I outlined, which was related to whether Trump obstructed justice by trying to illegally or inappropriately influence investigations of Russia’s conduct in 2016. In that scenario, I noted that while the evidence might not be sufficient to charge Trump with obstruction of justice — which is a high bar, legally — the report could have significant political fallout, fueling Democrats’ demands to make the full report public and spurring further investigations of the president. What happens next will mainly hinge on whether the full report is made public. Democrats in Congress have been calling for the report to be released for the past few weeks (and they’ve also demanded access to Mueller’s investigative files), but the decision is in Barr’s hands for now. House Democrats can subpoena the report, but that will likely lead to a potentially lengthy court battle over whether parts of the report are confidential or covered by executive privilege. Democrats are already questioning the decision-making process that led Barr to conclude that Mueller’s report did not support obstruction of justice charges. House Judiciary chairman Jerrold Nadler tweeted that he will call Barr to testify before Congress. Nadler’s statement suggests Democrats aren’t finished asking questions about Trump’s conduct — particularly as it relates to potential obstruction of justice. While Mueller apparently chose not to say whether or not the president obstructed justice, he has given Democrats important ammunition to demand the full report. That’s because although the report didn’t ultimately make a determination about whether Trump illegally obstructed justice — that was left up to Barr, who concluded that Trump’s behavior did not warrant charges — it does contain “evidence on both sides of the question.” This evidence could be quite damaging for the president politically if it’s made public, particularly since obstruction of justice is also an impeachable offense. That said, Democrats shouldn’t necessarily expect the full report to change the minds of the president’s supporters. 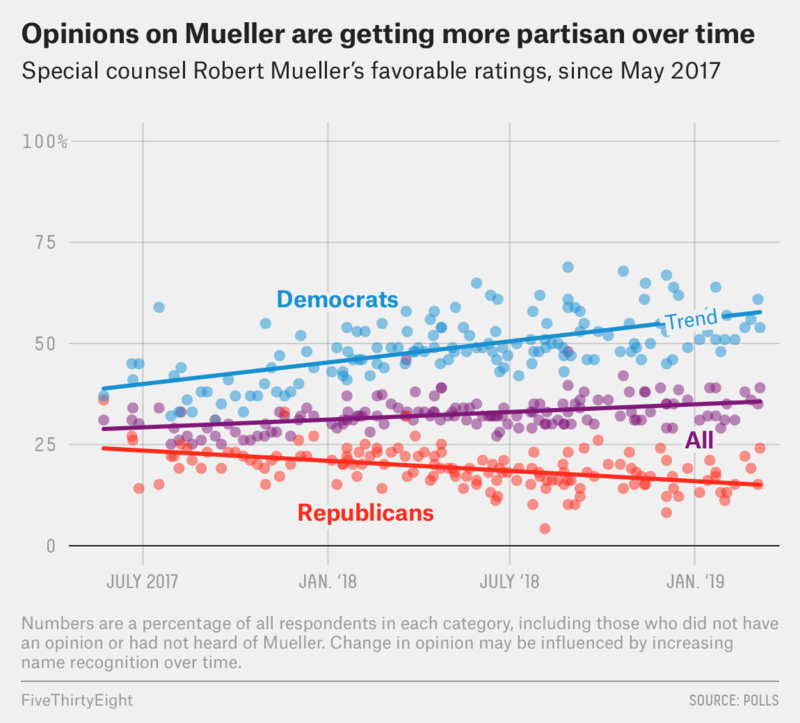 Over the course of Mueller’s investigation, the partisan divide in public opinion has solidified, with Republicans in particular growing more distrustful of the special counsel. Now the Democrats have an even higher bar to clear when trying to counteract Trump’s claims that they’re conducting “ridiculous partisan investigations.” So while Barr’s summary leaves the door open for further investigations of Trump by House Democrats and could lead to the full report becoming public, the lack of a decisive legal conclusion from Mueller may also make it very difficult to change Americans’ minds about the president, regardless of what’s in the report.